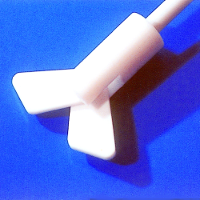 The Centrifugal Stirrer has a unique, fully moulded construction featuring a PTFE rotor moulded to a fully PTFE encapsulated steel reinforced drive shaft. Centrifugal Stirrers are also available with exposed upper ends which enables extra rigid clamping in the stirrer motor. In the table below Exposed end stirrers are marked with EX in the description.